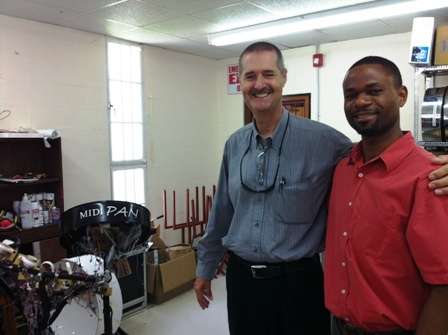 The place to be for finding the scientific analysis of then steelpan behaviour is at the University of the West Indies. Brian Copeland is dean of the faculty. I appreciated his time to meet and shake hands. Charming and knowledgeable and pround of his work. This faculty is working since long with Steelpans and physics. On the picture background is a midi steelpan. the play MIDI music on a real Steelpan. See blog entry : visit to Trinidad. record a payer on PHI Pan to PC and feed this back into the midi-Pan. Will it sound as natural as performing on a steel pan? Noticed that the Steelpan in MIKE orchestra is called Calypsophone. Just to highlight what the steelpan was made for and came from. So... yes, it was a very educational and stimulating day. Very strong motivating to keep working on ther Steelpan applications.